Our environmental situation is under constant scrutiny. With repeated warnings of global warming one can only wonder or rather, should wonder what can be done to help. Wanting to do their bit, the DIAC has decided to make the environment their first priority. Most of you must have noticed the enormous rectangular grid facing ‘skywards’ just outside the Michigan State University. For those of you who do not know, that is the ‘Solar Tracker’. Speaking simply, these solar trackers track the movement of the sun. We speak to Mr. George Varghese (B. Tech; M.I.E; C. Eng (I); M.B.A), the senior development manager (Campus Development/ Management) at DIAC to enlighten us about this initiative. The solar tracker tracks the movement of the sun .Tracking greatly improves the performance of the photovoltaic system. Trackers let the PV panels follow the course of the sun, so that the panel surface is always in an optimum angle to the sun rays. This guarantees highest efficiency. When was the solar tracker installed? 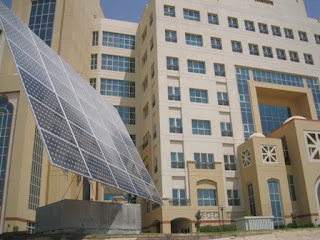 It was installed a month back, in August 2009 at DIAC facing the road as a pilot project. It’s expected to generate 3000 watts (approximately) of energy which is intended to light the external walkways lights in DIAC Phase 3. DIAC was a selected location because DIAC Phase 3 is LEED SILVER certified and use of green power would add value to the certification. It is important, as said before, with the relentless news of global warming, that we as students especially, know and act in ways that can help the world around us. ‘As solar power is considered as green power the carbon foot print is nil and helps us mitigate climate change and global warming,’ Mr. Varghese says, as he wants them to know that a lot can be done to help. How can we students help, specifically? New initiative and ideas for helping the environment are always welcome from students. An ‘eco club’ can be formed where students could be ‘eco warriors’, where the new initiatives can be explained to students. For those students who want to take a stand immediately, they can have a pledge written and taken, to reduce water consumption both at campus and home. This could perhaps be our initiative as part of ‘Environmental Campaign week’. Another very easy and efficient way we could help is by providing drawings, posters relating to the environment, which could be displayed in our respective universities and the food court. He goes on to add that there are other projects that students can get involved in. The area around the STP needs to be planted with trees and what better way than students planting these trees themselves as a part of a ‘tree planting campaign’. We’d like to thank Mr. George Varghese for his time and effort in answering all our questions and we’d also like to thank Shazadi Durrani, the student services coordinator at the DIAC student hub, for being kind enough to help us get in touch with Mr. Varghese. So, hoping to have touched your ‘green’ side by now, we hope to see you’ll soon, in ‘Eco Club’. Signing off, a future Eco Warrior.